30 Under Thirty held their first major fundraiser for HIV research. 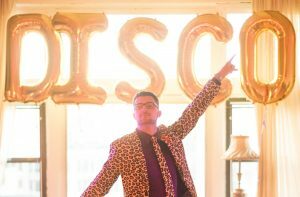 #DressedUpDisco was conceived by 30 Under Thirty co-chair Matt Hyams as a tribute to the early days of the HIV epidemic in North America. One of the first fundraisers held by the Gay Men’s Health Crisis (the largest volunteer AIDS organization in the early ‘80s) was a disco party with the intent to raise funds for HIV research. While the parties served to unite volunteers and those directly affected by HIV, they unfortunately did little in the way to raise money or awareness for the need of HIV research. Friday, June 3, 2016, however, was a different story. 30 Under Thirty raised almost $35,000 through is first major fundraiser #DressedUpDisco, and garnered media attention from some of Toronto’s best blogs. Generously supported by TD, #DressedUpDisco was held at the eclectic Loft 404 in downtown Toronto. Guests boogied to classic disco hits mixed by DJ Phil V, punctuated by performances from drag queens Tynomi Banks, Fay Slift,Scarlett Bobo, and Igby with Champagna throughout the night. Thrift stores Public Butter and Value Village – Bloor West donated threads to the pop-up dress up shop so unadorned guests could get into theme with sequined accessories and gold lamé outfits characteristic of the era. Partygoers could enter a paper airplane competition and win flights to anywhere in North America from CANFAR partner Delta, or try their luck in a balloon pop. Balloons were stuffed with prizes from Bestival, Kobo, Levetto,The Wickson Social, Barreworks, Ombra Spa, Brimacombe, and Folly Brewpub among others. Long time CANFAR supporters Labatt and TAG Vodka helped stock the bar along with new supportor Pierre Sparr, with friendly bartenders from David Lovell Events slinging drinks. Almost 30 volunteers decorated the venue, managed check-in, staffed the fundraising installations, served snacks, and helped with clean up late into the night. The party was captured by photographer Patrick Moher, a member of 30 Under Thirty, who also held a photoshoot with drag queens Dottie Dangerfield, Judy Virago, Barbie Jo Bontemps, and Dmanda Tension to create promotional materials and drum up buzz for the event.